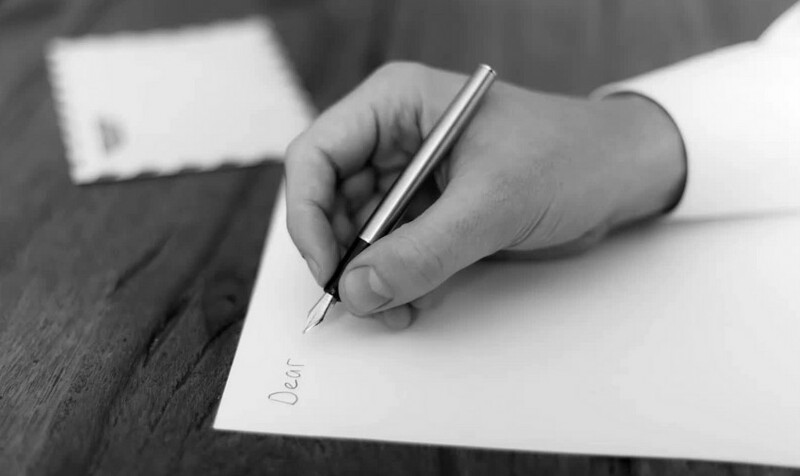 You are likely aware of recent changes to the American Board of Internal Medicine Maintenance of Certification (MOC) process and the rising physician opposition to MOC throughout all ABMS specialties. 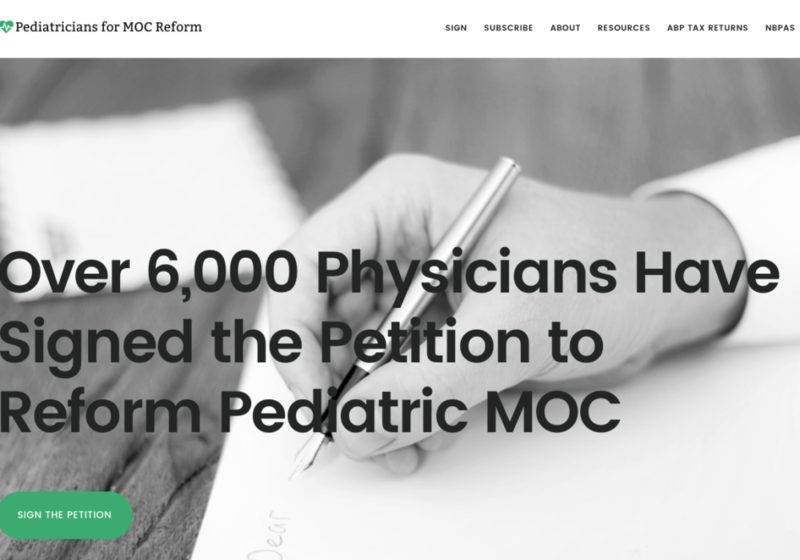 As pediatricians, we join our physician colleagues in other specialties and believe the American Board of Pediatrics MOC program should reform as well. Let us start with commonalities: we believe in lifelong learning. We believe in setting high standards for ourselves and those within our profession. We believe in scientific advancement, research, and exceptional patient care. But we do not believe that the current 4-step Maintenance of Certification (MOC) process best suits these goals. Not only is MOC time consuming and expensive, it has not been shown to improve patient care. As it stands, MOC is broken. It’s time to return board certification to a collegial educational endeavor. We support MOC reform in which a qualifying physician has to pass an initial certifying exam once, with subsequent continuing medical education (CME) as sufficient documentation of individualized lifelong learning. All board certificates are to be valid for the duration of one’s practice without the continual need for secure recertifying exams, or performance in practice modules . A simple two-part process requiring Professional Licensure, demonstrated via valid unrestricted state medical license, and Lifelong Learning, with ACCME-approved CME of the diplomate’s choosing rather than the limited choice of ABP/AAP proprietary products, will be regarded as sufficient to maintain certification. 1. Greatly reduce the cost and time burden MOC imposes. 2. Eliminate Part 4 Performance in Practice Modules. 3. Eliminate Part 3 Secure Recertification Examination. 4. Reform MOC into a streamlined two-part process requiring Part 1 Professional Licensure, demonstrated via valid unrestricted state medical license, and Part 2 Lifelong Learning, with individualized ACCME-approved CME of the diplomate’s choosing rather than the limited choice of ABP/AAP proprietary products. Too expensive. Inhibits time for research (which is quality improvement itself). I surrendered my certification over a year ago in opposition to the Part 4 requirement. It is about time that we realize as medical professionals that we hold the power, not the boards or the insurance companies. We have worked long and hard to care for others and MOC has become nothing more than an expensive distraction. I would like to return to meaningful learning that benefits my patients. I long ago gave up pediatric re-certification. This mess just reconfirms my decision! The current MOC process does not enhance , nor encourage learning. Rather , it feels like it is a money making ploy by ABP. I am very disappointed and disheartened with the current state of MOC, and I wholeheartedly agree with the above recommendations for reform! I no longer will participate in recertification because of the time-consuming process and expense. 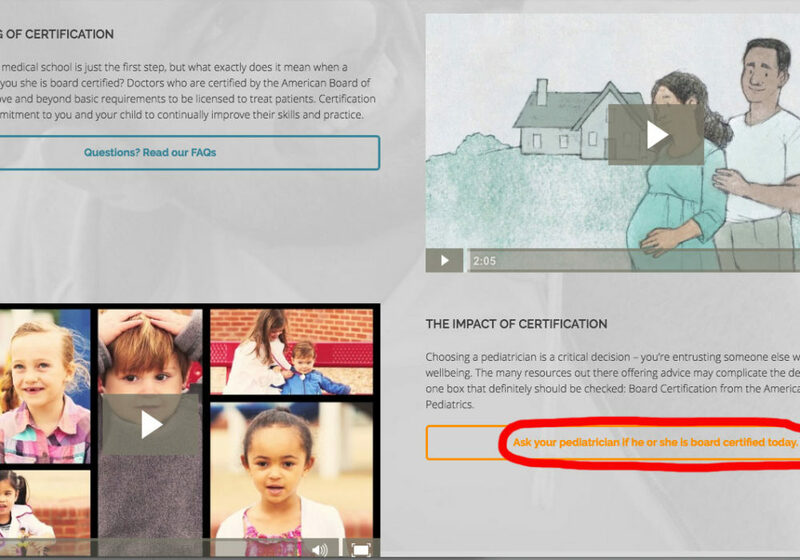 It is time for a just form of maintenance of certification without the economic and time burden on pediatricians who are already overworked and grossly underpaid. We need sensible means of maintaining our certification as outlined in the requests above and to minimize the monopoly and business model followed by the ABP. We need MOC reform now! I've taken the recertification test twice. The last time was in December 2015. I took offense being treated like a criminal......wanded, asked to remove clothing, and patted down. This process is demeaning.